Let your little furry friends jump up and down easily and happily at the comfort of home with this 4 Steps Dog Stairs Cat Scratching Post Pet Ramp Ladder w/Washable Cover - Brown. 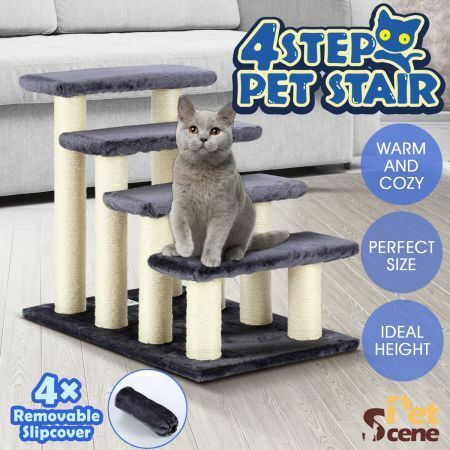 Suitable for tiny, small and elderly pets, this three-step pet stair allows your cuddly friends to reach the bed, sofa, chair or other higher spots with ease. Made of pressed wood and covered with faux fleece, this pet ladder is a stable and cozy place for your little one to sleep, perch, exercise or play. The cover can also be removed and washed for convenience and hygiene, which makes cleaning effortless even after cats or dogs playing for a period of time. The eight scratching posts can also protect your furniture from wear and tear by providing a perfect outlet for your feline friend's scratching instinct. Moreover, the classic exterior design can lend a stylish touch to your home. Imagine that, this portable pet steps can be placed in your car to entertain your dog or cat for them getting in and out. This brown pet ramp comes with tools and step-by-step instructions, so you can assemble it quickly. What a versatile climber for your little fellow! Bring it home and cheer up your little companion! Fantastic for our small dog to get on the bed easily and without waking me up to be put up. Easily assembled and good quality.